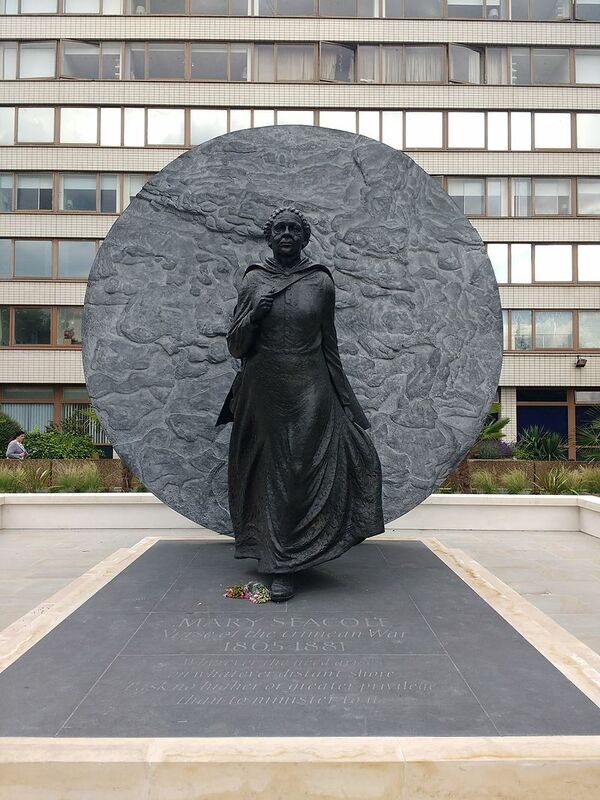 On 30 June of this year (2016), after a twelve-year campaign, a statue of Mary Seacole was unveiled at St. Thomas's Hospital, London--though not without a great deal of controversy. The story of Seacole and her role as a nurse in the Crimea has been largely overshadowed by that of her much more famous contemporary, Florence Nightingale--and, in fact, much of the opposition to recognition of Seacole has come from various Nightingale supporters and organizations, notably the Florence Nightingale Society. It's hard to see why these two women and their contributions have been pitted against one another--except, of course, the belief that there couldn't possibly be two accomplished, notable women working in the same profession at the same time in the the same place. I will let you google for yourself if you're interested in learning more about this "controversy" over Mary Seacole--Patrick Vernon's "Rubbishing Mary Seacole" (The Guardian, 21 June 2016), is a good introduction to the whole sorry mess. My mother kept a boardinghouse in Kingston, and was, like very many of the Creole women, an admirable doctress; in high repute with the officers of both services, and their wives, who were from time to time stationed at Kingston. It was very natural that I should inherit her tastes; and so I had from early youth a yearning for medical knowledge and practice which has never deserted me. . . . [From her,] the ambition to become a doctress early took firm root in my mind; and I was very young when I began to make use of the little knowledge I had acquired from watching my mother. . . .
my experience of travel had not failed to teach me that Americans (even from the Northern States) are always uncomfortable in the company of coloured people, and very often show this feeling in stronger ways than by sour looks and rude words. I think, if I have a little prejudice against our cousins across the Atlantic – and I do confess to a little – it is not unreasonable. I have a few shades of deeper brown upon my skin which shows me related – and I am proud of the relationship – to those poor mortals whom you once held enslaved, and whose bodies America still owns. And having this bond, and knowing what slavery is; having seen with my eyes and heard with my ears proof positive enough of its horrors – let others affect to doubt them if they will – is it surprising that I should be somewhat impatient of the airs of superiority which many Americans have endeavoured to assume over me? As a child, young Mary Grant received an education from a woman she referred to as her "kind patroness" and more practical training from her mother, whom she assisted in the running of the boarding house and with her healing practice. In 1821, she traveled to England visit relatives. After a year she went back to Jamaica, then returned to England, taking with her West Indian spices, preserves, and pickles for trade, this time staying until 1825. In her autobiography, she provides few details about her trips to London--nothing about where she stayed or how she supported herself--though she does note that her companion, a woman whose color was darker than her own, was taunted by Londoners with "rude wit." She returned to Jamaica again, this time nursing her elderly patron and working with her mother, at times caring for invalid soldiers and their wives. (She mentions working at the British Army hospital in her memoir.) On 10 November 1836 (the occasion for today's post), she married Edwin Horatio Seacole, an English merchant (said also to be the godson of the great British naval hero, Admiral Horatio Nelson--according to family traditions, Seacole was Nelson's illegitimate son). Within a few years, Mary Grant, now Mary Seacole, suffered a number of personal tragedies: in two short years, 1843 and 1844, Blundell Hall burned down, her husband died, and her mother died. She allowed herself a short period of grief, then set about rebuilding her mother's business. She made a success not only of the business but of her nursing skills, notably in the cholera epidemic in Jamaica in 1850. In 1851 she joined her brother in Panama--arriving in time to experience a cholera epidemic that swept through the city of Crucis--her nursing experience, in particular treating cholera, helped. She assisted the rich, who paid for their treatment, and the poor, whom she treated for free. While in Panama, she also opened and ran a hotel. After returning to Jamaica in 1853, she again encountered disease; this time, authorities asked her to help in treating victims of yellow fever. She treated some in her boarding house, others at the British Army camp. In 1854 she was on the move again, returning briefly to Panama. In her autobiography she writes of having been compared to the Greek hero (and wanderer) Odysseus, a comparison she does not appreciate--"Some people, indeed, have called me quite a female Ulysses," she writes, adding, "I believe that they intended it as a compliment; but from my experience of the Greeks, I do not consider it a very flattering one." In Panama, she read of the escalation of the war in Crimea and decided to volunteer her services as a nurse. 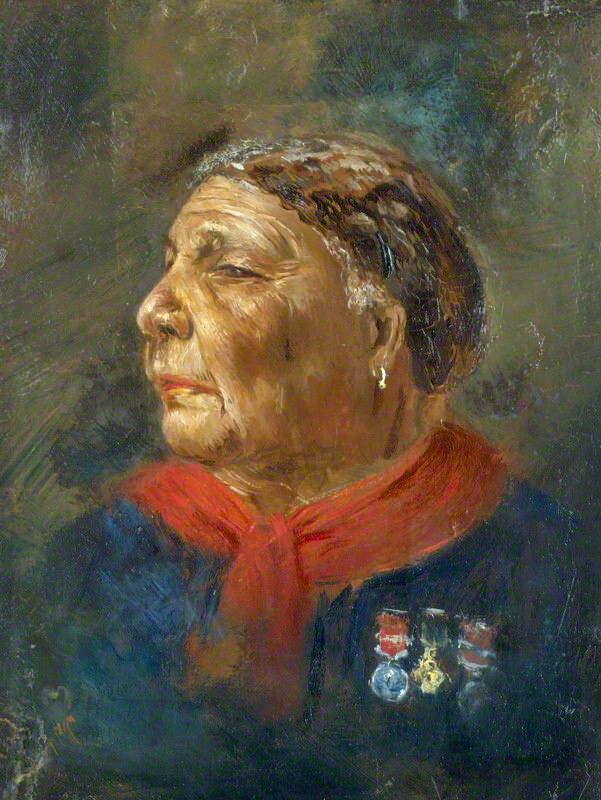 Seacole left Panama for England, and although she brought with her "ample testimony" of her experiences, the War Office denied her application to be sent to the Crimea. An appeal to the Crimea Fund, a publicly sponsored organization that raised money to support the wounded, was also rejected. She left England in January of 1855--on her long trip, she writes of encountering men she had formerly treated, who greeted her with cries of "Mother Seacole, Mother Seacole!" During a stop in Malta, she receives a letter of introduction to Florence Nightingale to add to the many letters of reference she had received from British officers stationed in Jamaica. [A nurse says to her,] "Miss Nightingale has the entire management of our hospital staff, but I do not think that any vacancy--"
"Excuse me, ma'am," I interrupt her with, "but I am bound for the front in a few days;" and my questioner leaves me, more surprised than ever. The room I waited in was used as a kitchen. Upon the stoves were cans of soup, broth, and arrow-root, while nurses passed in and out with noiseless tread and subdued manner. I thought many of them had that strange expression of the eyes which those who have gazed long on scenes of woe or horror seldom lose. In half an hour's time I am admitted to Miss Nightingale's presence. A slight figure, in the nurses' dress; with a pale, gentle, and withal firm face, resting lightly in the palm of one white hand, while the other supports the elbow--a position which gives to her countenance a keen inquiring expression, which is rather marked. Standing thus in repose, and yet keenly observant--the greatest sign of impatience at any time, a slight, perhaps unwitting motion of the firmly planted right foot--was Florence Nightingale--that Englishwoman whose name shall never die, but sound like music on the lips of British men until the hour of doom. She has read Dr. F—'s letter, which lies on the table by her side, and asks, in her gentle but eminently practical and business-like way, "What do you want, Mrs. Seacole--anything that we can do for you? If it lies in my power, I shall be very happy." With this "blessing," Seacole traveled on to Balaclava, where she built her British Hotel from scrap materials she could scrounge. The hotel opened in March 1855. Seacole provided meals, comfort, support, and care. As a correspondent of The Times reported in September of that year, "Mrs. Seacole . . . doctors and cures all manner of men with extraordinary success. She is always in attendance near the battle-field to aid the wounded, and has earned many a poor fellow’s blessings." In her memoir of the Crimea, Lady Alicia Blackwood wrote that Mary Seacole "personally spared no pains and no exertion to visit the field of woe, and minister with her own hands such things as could comfort or alleviate the suffering of those around her; freely giving to such as could not pay." Seacole continued her work in Crimea until the war's end; she returned to England, she would later write, "poorer than I left it." She was declared bankrupt in 1856. But when her plight was made known in the British press, a fund was established, raising enough money to discharge her bankruptcy. The fund was supported by the many soldiers and officers she had treated and tended. Undaunted, she hoped to travel to India in 1857 after the Indian Rebellion, but fundraising on her behalf was not successful. 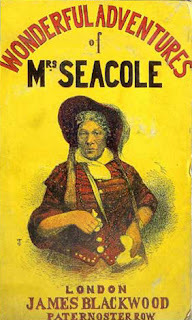 In the end, she returned to Jamaica after publishing her Wonderful Adventures of Mrs. Seacole in Many Lands, the first autobiography published by a Black woman in England. In Jamaica, Seacole once again experienced financial difficulties. Hearing of her straitened circumstances, London supporters and patrons, including the prince of Wales, the duke of Edinburgh, the duke of Cambridge, and many senior military officers, raised funds for her. Although she would return to England in 1870, seemingly to offer her services as a nurse during the Franco-Prussian War, she did not go. She remained in London, dying there on 14 May 1881. You can read Seacole's autobiography by clicking here. There are several new biographies and many online resources, including this useful site from the BBC. It is just too bad that if you Google Seacole's name, you'll have to wade through all the crap. Too bad her detractors seem to think that recognizing Seacole somehow damages Nightingale (who herself would attempt to undermine Seacole by insinuating her British Hotel was really nothing but a brothel). Too bad more people don't remember the assessment of Sir Howard Russell, the Times war correspondent: "I trust that England will not forget one who nursed the sick, who sought out her wounded to aid and succour them, and who performed the last offices for some of her illustrious dead." His words are now engraved on the sculpture of Seacole. Why would anyone want to trash a woman like that?